After a wildfire, there are simple, commonly accepted steps to take in minimizing the wildfire's effects on water quality. Installing floating debris boom (also known as debris barriers) is an important step in reducing the impact of a forest fire on the downstream water systems. Orion floating booms, made in the USA by GEI Works, are effective tools in capturing floating contaminants and debris, and keeping them within a designated containment area. 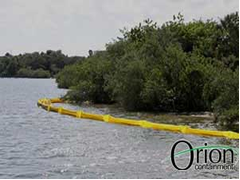 Floating debris barriers can also be configured to block debris from entering protected areas. Our Debris Barriers are rugged, affordable, and customized to your needs. Floating booms, for sale by GEI Works, are available in a wide variety of styles, allowing you to select the model that will best fit your environment and requirements. As the manufacturer, GEI Works can help to address your emergency response situation by providing innovative and site-specific solutions, and affordable custom options as needed. Our representatives can also help with any questions. While our standard floating debris boom is our most common option for wildfire debris containment, we offer additional models depending on the situation. 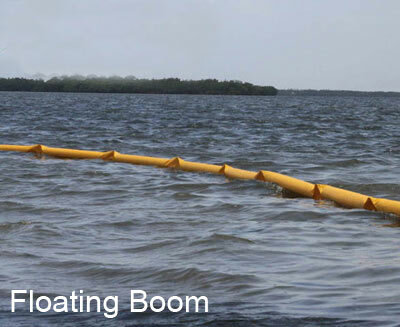 Standard Floating Debris Boom: Made from marine grade UV resistant PVC fabric, these floating booms are designed for durability and high strength debris containment. 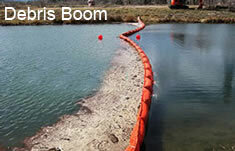 This debris barrier is available in calm water, moving water, and open water models. Permanent Floating Debris Boom: This heavy-duty floating barrier is designed for long-term control of floating debris, and presents significant savings due to its long field-use life. They are constructed from robust fabric belting with high tensile strength, strong abrasion resistance, and treated to withstand UV exposure. Steel Mesh Floating Debris Boom: Designed for extreme strength and durability, the Steel Mesh Floating Debris Boom is one of the strongest options available for debris containment. Its robust design and hearty construction equip this floating boom to contain both small and large floating debris, including logs, branches and other floating debris. Floating Turbidity Curtain: When the water quality is affected beneath the surface, consider Triton Turbidity Curtain (link to new page) for a solution that will address containment of both floating debris and suspended sediment particles. It may seem daunting at first, but once you know what to do after a wildfire to minimize the impact on your property or job site, you'll see that the easiest (and most effective) step is to address erosion control. After a wildfire has run its course, the soil is left bare and charred with little to no support left for protection against the elements. Topsoil washes away easily, steep slopes become unstable, and the risk of flooding (and even mudslides) increases significantly. With each storm event, the unprotected soil washes into, disrupts, and pollutes the water systems. By protecting the exposed soil with erosion control measures (like coir or straw logs and blankets, geotextile fabrics, etc. ), you can make significant progress in minimizing the wildfire's effects on water quality and your property. We also offer a wide selection of erosion control products that can help. For specific recommendations, see: What to Do After a Wildfire. Do you have questions about floating debris boom? Contact GEI Works at 1-772-646-0597 for answers!